Within reach of the final stretch goal of its Indiegogo campaign, Lab Zero Games, developer of Skullgirls, have added a new, rather unconventional, final target: if they can pass $725,000 in the last 11 days of their campaign they will give their fighting game engine to Mane6 for free. 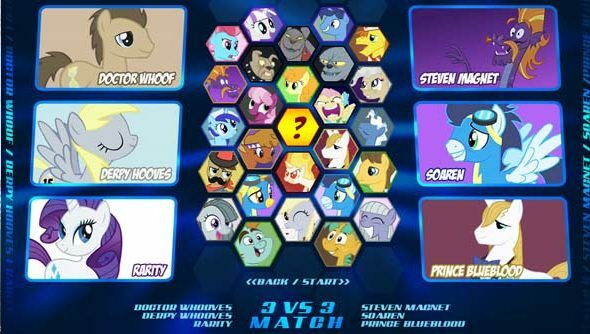 Mane6 found fame after developing My Little Pony: Fighting is Magic, a 2D brawler featuring characters from the brony-spawning My Little Pony series. The engine wouldn’t be used to develop Fighting is Magic, the team was ordered to halt development of its unofficial project by My Little Pony’s license holder, Hasbro. Instead it would be used for their currently unannounced new project. The game will be much akin to their cancelled game, though it will feature new characters and a new setting. However, Mane6 have brought on Lauren Faust, one of the original creators of My Little Pony. So it’s fair to assume the new game won’t be falling too far away from the concept and style of the old. Lab Zero have found immense success in their Indiegogo campaign; originally seeking $150,000 to finish the port of their anime fighter to the PC and to bulk out its character roster by funding development of a new DLC pack, they’ve so far managed to raise more than $420,000 – funding two new characters (with a third being unlocked at $450,000) and single player campaigns to accompany them. In other news… Autumn and Lab Zero have agreed to give Mane the #Skullgirls engine free if we reach $725,000. Spread the word! So that’s all very nice.